We’re putting the final preparations in place for this year’s annual College of Podiatry Conference in Glasgow this week [Nov 17th to 19th]. where Firefly will be introducing new products, fresh technologies and delivering two demo workshops. 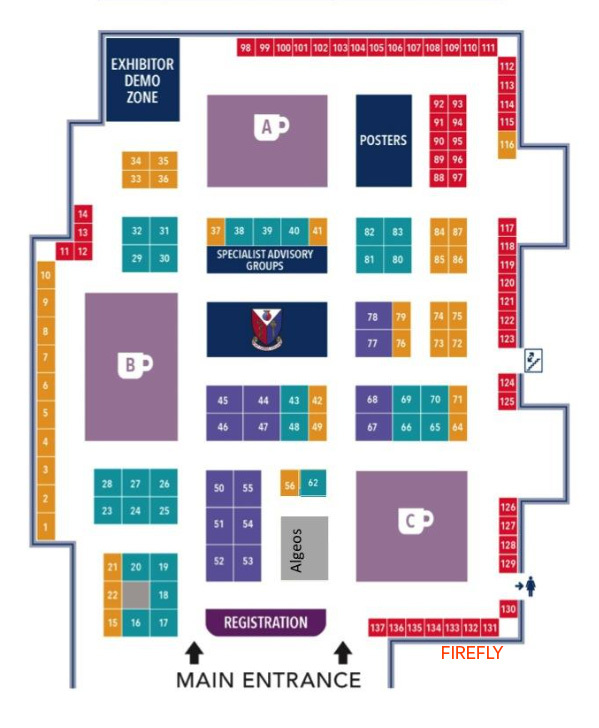 At the bottom of this post you’ll find the Exhibition Space floor plan, Firefly’s stand is located at the bottom right at stand number 131-133. Firefly is committed to continuously exploring new technologies and bringing these to you. We’re building a knowledge base in the area of 3D printed foot orthoses as we believe this is where the future of custom made prescription devices lie. Last year we partnered with New York based company SOLS and offered 60 conference delegates the opportunity to trail their SOLS Rx devices. The feedback we received from the delegates who trialled the SOLS Rx devices was revealing. In a nutshell, delegates found the technology exciting, but the SOLS system did not produce an orthotic that matched the anatomical accuracy of traditional casting methods. You can read more about the SOLS trial here. 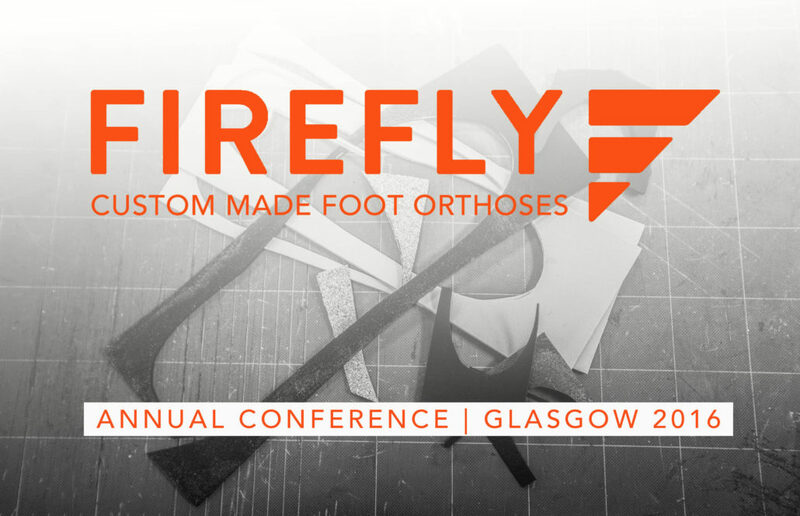 As Firefly continue to explore the space of 3D printed orthoses, at this year’s conference we introduce Wiivv Wearables to the UK market. Wiivv use a similar process to SOLS; again mobile device technology captures images of the foot, this data is then used to produce the 3D printed orthoses. In Firefly’s clinics, our Podiatrists have successfully introduced Structure Sensor scanning technology into their workflow. This technology eradicates the mess associated with Plaster of Paris casting and foam boxes. The Structure Sensor aligns with Firefly’s new digital fillable order forms, reducing lead times when ordering Firefly custom made orthoses. Also, at this year’s conference, Firefly will be giving away an iPad and Structure Sensor – make sure to visit our stand to enter the draw!!! We believe Wiivv [pronounced ‘weave’] offer a more intelligent application of software to the design and fit of device to anatomy. We’ll be giving over 200 delegates the opportunity to trialWiivv’s devices. Wiivv’s manifesto states: “We want to start by promising to give you the tools to be your exceptional self. We are here to help humans like you to squeeze a bit more awesome out of every step, and we are pumped you have joined our tribe”. Make sure to call to our stand [number 131-133] to find out more. See what happens. We’re also launching NSOLS, our new exclusive range of over the counter devices at the conference. NSOLS are designed to improve joint alignment, reduce damaging forces and keep you moving. Whether you are a keen sports person or simply enjoy walking the dog NSOLS will keep you comfortable, pain free and mobile! We’ll have sample devices for you at the Firefly stand. Firefly will be delivering two 15 minute workshops at this year’s conference, demonstrating the Structure Sensor technology alongside plaster of Paris and foam box casting. You’ll learn all you need to know about casting using foam boxes, Plaster of Paris and we’ll introduce you to the new Structure Sensor scanning technology. These workshops take place on Thursday (17th) evening at 6pm and on Friday (19th) at 3.30pm. Not content with all that, at the Firefly stand we’ll also be demonstrating the lower limb joint mobilisation application, the Mobisit. If you have movement pain in your joints or spine, physicians were long of the opinion that the affected region of the body should be rested. Today, their recommendation is: movement helps against pain – in reasonable amounts. With the Mobisit, you can precisely tailor the vibration therapy to your needs and thereby ensure gentle pain relief. Call to the Firefly stand to see the device in operation. Building on the success of last year’s conference in Harrogate, Firefly’s offering this year promises to be bigger and better. You’ll find us at stand 131; when you enter the main entrance of the exhibition hall at the SECC, just turn right and you’ll see the Firefly stand adjacent to the coffee area. We will announce the winner of the iPad and Structure Sensor scanner on Friday evening, make sure you visit our stand before Friday to enter your name in the draw. Looking forward to seeing you in Glasgow.